I got three very nice games for Christmas this year. Here's a quick summary of my initial thoughts. 1. Dominion: Hinterlands - We only got to play one game of this. We used all new cards, so it was a bit confusing at first. The game was fun--this is the first game we'd ever exhausted the entire Silver pile! I'll have to try the other cards out when we get back from our trip. 2. Eminent Domain - I had been wanting to try this deck-building entry for some time. Our first game was difficult and full of errors, but still pretty entertaining. We started figuring it out by the end. A few days later my daughter and I played it again. She still hasn't got it down, but I started buying lots of the tech cards and ramping things up. Final score was 44 to 22, with Isabel declaring that she would never play again. Maybe she'll come around. Bottom line: this is a good game with lots of interesting mechanics but it has a bit of a learning curve for new players. Multiple plays are required to figure it out. But it's really quite fun after that! 3. Quarriors! - I was just curious enough to put this on my list. First off, I hate the theme. It looks like playing Pokemon. I'm nearly 35. I'd feel really dumb playing Pokemon. That said, Quarriors is pretty fun and quick. I'm curious to see how the expansion plays . . . In addition to the new games, we also continued our fascination with Pirate Dice. I have two sets now, so we can play with up to eight. It's become our party game of choice. Highly recommended, especially for new players! Hope you have a great new year--see you in 2012! Wishing you and your family a very geeky Christmas and a happy new year! 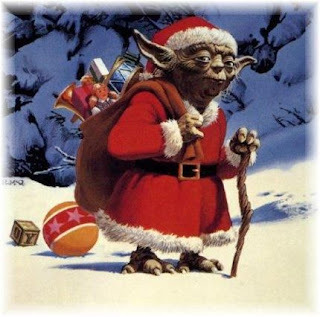 And happy holidays to you other fine folks! See you in 2012! 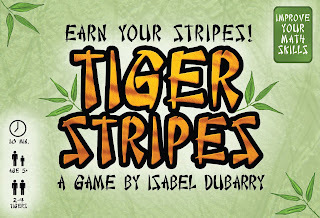 Tiger Stripes 20% Off Sale! 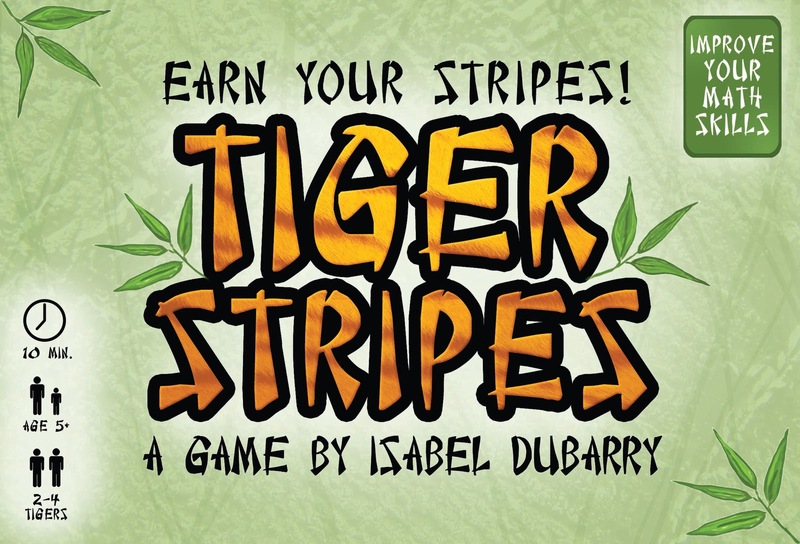 In honor of Isabel being on TV (for just a few seconds at the end of the clip), we are offering a 20% discount on Tiger Stripes. Have any kids or grand-kids learning about addition and subtraction? Get them a great Christmas gift for just $14.99 $11.99 plus shipping! This deal is good until December 16. You design a game (or at least come up with a cool new idea), and then someone else beats you to the punch. Keep in mind, I'm not accusing anyone of theft or anything. I believe this is a total coincidence, but enough of a coincidence that I wanted to share it with you. I have been shopping around a game I call Square Off for a couple of years now. 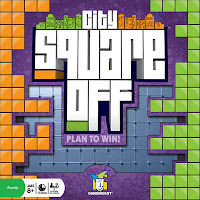 The other day, I learned of a new product from Gamewright called City Square Off. The games are nothing alike--it's only the names (and logos) that are similar. Or is it just me? Anyway, it's just weird. Now to think up a new name. I helped organize a program for Nation Game Day at my local library. Unfortunately, only one kid showed up! :( I'm choosing to put the blame for this squarely on the lack of advertising by the library and the insanely beautiful Saturday afternoon weather. Saturday, Isabel and I participated in a little Dominion tournament at Gateway Games. Isabel had a better score than I did and just missed second place by a few points. Very nice time regardless! 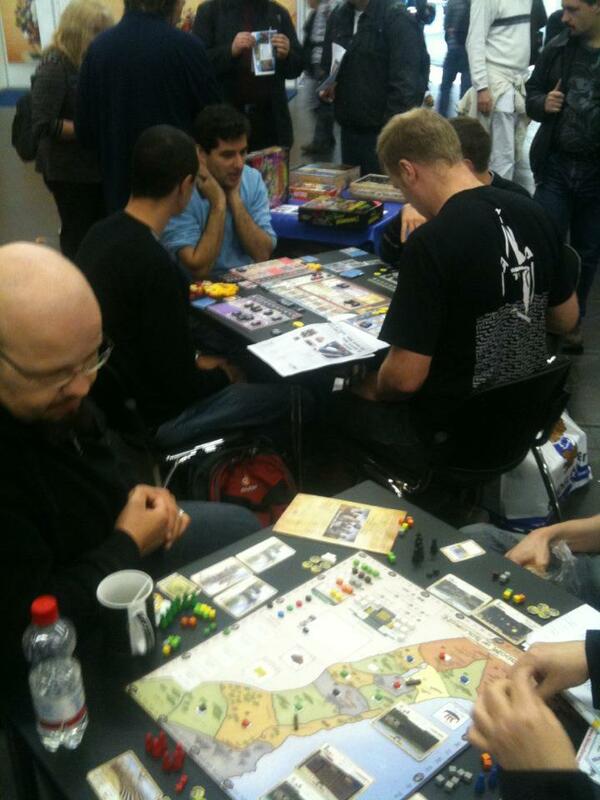 Also, BGG.con just wrapped up down in Texas. James of Minion Games was able to attend and gave me a good report of the demos he ran of Kingdom of Solomon. However, we recently learned that Ludofact will not be able to ship all our games (my game and two others have to be shipped in the same load) for a bit longer. This means the boat will be a bit later and then US distribution will be a bit later. Right now it's looking more like January or even February before the games make it to local stores and people's doorsteps. We are so sorry to be missing the holiday season--and extremely sorry to disappoint anyone's gift-giving plans. Let me leave you with something nice: I have become a diehard fan of the Ludology podcast. These guys do the Game Tech feature on the Dice Tower podcast. The show is fantastic--you almost need to take notes! If you're a game designer, or just curious about game mechanics, give it a listen. I got to attend the second annual Cincinnati Comic Con this year at Duke Energy Center. Unfortunately, I only got to be there until noon, and my few pictures of the event were somehow erased from my camera (must have been that faulty restraining bolt). It seemed like lots of people were there--more than last year (when it was at the Cintas Center). The gaming area, sponsored by Yottaquest, was slightly easier to find, though still a bit out of the way. But it was much bigger, so that was good. 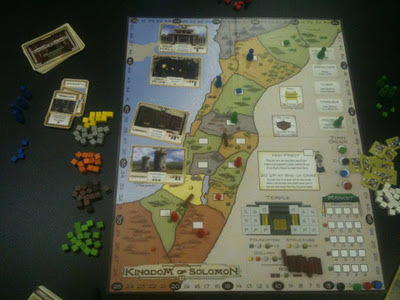 I got to show Kingdom of Solomon, Tiger Stripes and Revolution!, running one actual demo of the latter before I had to go. I was able to get one of the Yottaquest guys (Scott) to help demo for the rest of the day, but I haven't heard how this went yet. Also, I got to meet Katie Cook and see lots of cool comic-related stuff in the main hall. If you missed it, you should definitely think about stopping by next year! 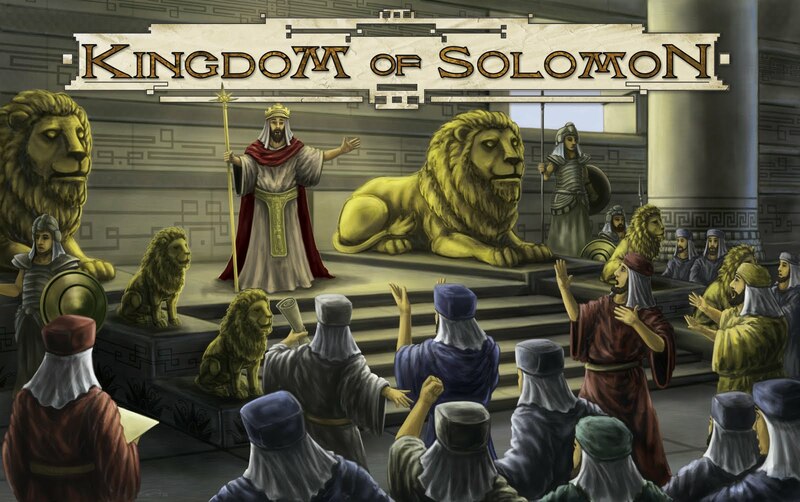 Just days (hours) before the final printing, we have decided to make one final adjustment to Kingdom of Solomon. The Temple will now have six extra spaces to fill. During our demos at GenCon, we ran into a few people who got carried away with building the Temple even against their own interests. Just because it was there. This led to a shorter-than-expected game and an unsatisfying experience for all. 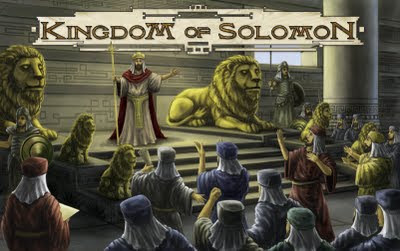 A quick recap: The game ends on the round when either all eleven building sites are filled, or when one player places all five of his buildings, or when the Temple is completed. 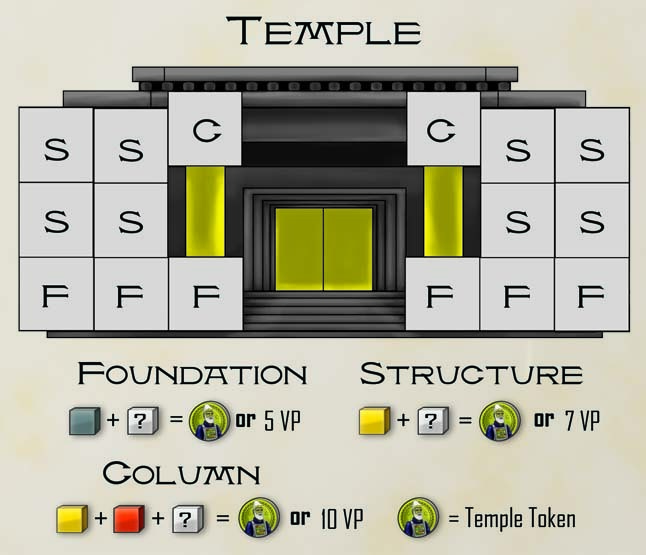 Having the most Temple Tokens (gained by helping the build sections of the Temple) also gives a player control of the High Priest and 20 VP at the end. So rushing to complete the Temple might seem attractive, but is usually not best way to score points. I'm still convinced that players would never repeat this mistake in subsequent games, but in this world of thousands of new games, one play might be all my game gets at some tables. Therefore, we added more spaces. 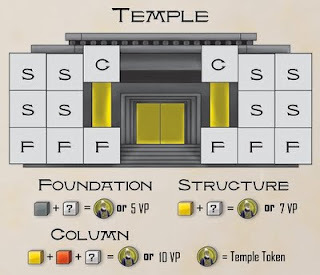 Now even all the players working together cannot complete the Temple in fewer than four turns and are far more likely to have a "full" game experience. This change will not necessarily add any extra length to the game, as the other two end triggers remain unchanged. Playing time will still normally fall into the 60-90 minutes range. Also, checkout the new BGG microbadge! 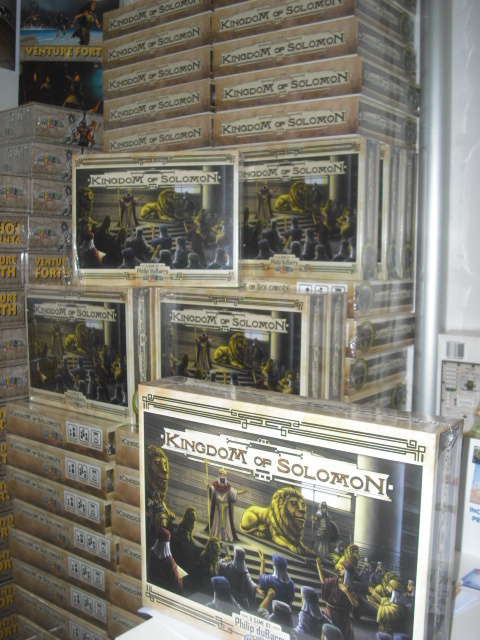 One final note: If you will be attending Essen 2011 and would like to preorder KoS and pick it up at the show, use the code PICKUP11 at checkout and you will not be charged for shipping. The current preorder price is $44.99! Visit Minion Games for more details.